News Updated: After updating to iOS 10 public beta some twitter posts show that “cannot download and update app on AppStore“, and this issue is affecting many popular apps, such as Pokemon Go and Snapchat. And people guessed that it is because of the server issues of AppStore. Actually, this is one of common iOS problems you may meet on your iPhone, iPad and iPod touch. And many sites have offered the fixes on this iPhone apps won’t update problems. Now let’s follow the tips below to fix this problem. Make sure your iPhone to be connected to stable WiFi or cellular data network. And you should turn off “Airplane Mode”. If you don’t use Wi-Fi, open “Cellular “ menu and make sure it is turned on. If you use WiFi, just check whether it is be correctly connected with your router. In addition, the router should work normally and be connected to the Internet. Make sure you are using the correct Apple ID to download and update apps on your iPhone 6/6s, especially when you have multiple IDs. Your Apps downloading may be frozen and stopped. So double press your Home button to turn off your App Store and re-open it and go to iPhone apps updating. Just turn off your iPhone and then turn on by holding Power button. Or have a hard restart by holding both Sleep/Power and Home bottoms. After Restart, now try to open your App store and re-download the updates on your iPhone 6/6s. Before do this, you should know all apps data will be deleted. If you don’t want this happen, jump to the next tip. If your iPhone now is working in iOS 9 or iOS 9.1/9.2/9.3, you can choose to update to iOS 9.3.5 or recently released iOS update (It was said that the new iOS 10 will be released in 7th of this September), which may contains some fixes to solve your”won’t update issue”. Tip 7. Apple AppStore Sever Problem – Wait…. Sometimes the problem is not on your side, but Apple AppStore itself. So just wait for Apple gives you the solution. Normally, this issue can be quickly fixed in a few days. The above are only some basic tips to fix iPhone apps can’t be downloaded and updated. If you have some ideas, just post your comment below to share with us. Normally, the deleted iPhone pictures will be stored in the Recently Deleted folder on your iPhone Photos app for 30 days. But what if you have no Recently Deleted Albums on your iPhone but accidentally deleted some photos? Will these photos be deleted permanently and can you recover them from iPhone? In this post, we collected some tips to fix this problem and give you the ways to get back deleted photos on iPhone. Suitable for iPhone 6/6s, and iOS 8/9/9.1/9.2/9.3. Collected some tips to get back the Photo album “Recently Delete”. Although all of them are not official or 100% correct ways to fix the problem, you can also have a try. Restart your iPhone: You can restart your iPhone by hold on Home and Power buttons at the same time for a while to restart your iPhone. Reset all settings: Just try to reset your iPhone setting to default by going to Setting > General > Reset > Reset All Settings. If you can’t retrieve the Recently Deleted album from your iPhone 6s but have an iCloud or iTunes backup, you also have chance to get back your mistakenly deleted pictures. You can restore your iPhone with iTunes or iCloud backup or extract only the Camera Roll photos from backup by using some iPhone backup extractor tools, such as AnyTrans, which also posted its tutorial: How to download photos from iCloud backup. You may have some good idea to fix this problem, just share it on the comment section below! We all know that, with Apple iCloud, we can back up messages, contacts, pictures and some other types of data on our iOS devices so that we can get back them when some accidents happen and data lose on our iPhone/iPad. However, when starting our first restoring, we often meet some problems. In this post, we share the basic tip about how to restore from an iCloud backup on iOS 9/iOS 9.3.5 or iOS 10). Additionally, we offer some tips you should know before restoring from iCloud backup and offer you some alternative method. Now let’s check all of these! The iOS version of your device should be newer than that of your iCloud backup, or you can’t restore your device and have to update your iPhone, iPad or iPod touch to the latest version. Some types of data couldn’t be recovered if your plan to use a backup of another kind of device to restore. For example, restore iPhone from one iPad backup. File types: photos, messages and attachments, voice memos, some un-compatible apps. Make sure that the Wi-Fi connection is stable and device is connected to a power. We need an restoring sometime when losing all data on an iPhone 6/6s or deleting some important info on iPad by mistake. Now follow the steps below to restore you iOS 9 device from iCloud backup. Note: restoring will erase all data on your device! Step 1. Go to Setting > General > Reset, tap “Erasing all content and settings”. Step 2. Set up your iOS 9 device by restoring from iCloud backup. Step 3, Sign in to iCloud > “Choose Backup” to restore your device in iOS 9. There are many iOS recovery tools you can use to extract iCloud backup. For example, PhoneRescue is able to extract 20+ types of files on iCloud backup to your computer, no matter Mac/MacBook or Windows computer. “When using Spotlight Search and typing letter to get one contact I know, I failed. I tried many times on my iPhone 6, finally found there was no contact that could come out in the result search page no matter what letter I typed. I found it happened after I update my iPhone to iOS 9, so how can I fix this problem”. Recently, so many iPhone users encountered this iOS 9 problem about iPhone contacts missing in Spotlight search result. And it happened to some iOS 9.0.1/9.0.2 users also. In this post, we provide one tip for you to have a try, which is extremely simple and helps some people out of this issue. Now let’s check it. 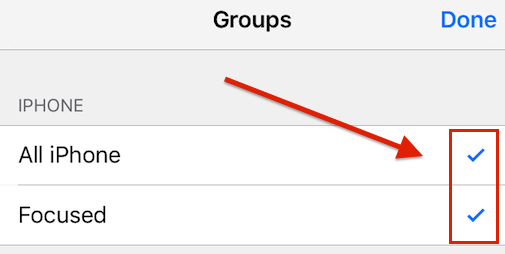 Go to Contacts app on your iPhone and tap “Group” on the top-left corner. Deselect all groups to make sure no contacts appearing in the contact list. Reselect the groups again and reactive all of your contacts. Welcome any comments about how to solve this iOS 9/9.0.2 problem. And your idea may help others! Apple has officially released the final version of iOS 9 after about 3 month beta testing, and brings some new features to iOS users, including smarter Siri, low-power mode, and some new build-in apps’ improvements (Maps, News, Notes etc). If you are one of Apple users who have upgraded your device to iOS 9.1 beta， downgrading to iOS 9 final is also worthwhile because the final version is absolutely more stable than beta – beta version is for testing and always has some bugs you can’t fix. We find this solution on Apple forum, which tells you how to downgrade from 9.1 beta to iOS 9 without losing your content and setting on your iOS devices. Step 1. Connect your iPhone/iPad/iPod touch to iTunes. Step 2. While your device is connected, force restart it. Press and hold the Sleep/Wake and Home buttons at the same time. Don’t release when you see the Apple logo. Keep holding until you see the Recovery Mode screen. Step 3. Choose Update to download and install the latest non-beta version of iOS. After updating to iOS 9.3.5 or iOS 10, do you find that there is almost no spare room to take pictures/videos or download new app/game on your iPhone/iPad? The storage of iPhone 6 and the newest iPhone 6s/iPhone SE is limited, especially for the 16GB users. Although it rumored that the basic storage of upcoming new iPhone 7 would be 32GB, if you are one of enthusiasts for music, movies or games, iPhone storage would be quickly be run out, too. So it’s necessary for you to know some tips about how to organize storage space on your iPhone and clean up space on your iPhone 6/6s/se or iPad/iPod touch. After checking your iPhone storage usages, you can get out what types of files or which apps are eating you iPhone space. Now start to organize these kinds of files by following the tips below. News: Mar 2016, some users found iPhone storage suddenly be full, and it said removing WhatsApp was helpful to fix this problem. Camera Roll photos or videos you took are always one of the top 10 data types which taking up your iPhone storage. If you want to clean them and free up your iPhone, you’d better backup them to you computer or iCloud. Tip 2. Delete unused apps on iPhone 6/6s/SE, especially the large ones. Tip 3. Free up Safari Storage by Cleaning History/Cache. iPhone > Setting > Safari > Clear History and Website Data. Note: Before deleting text messages, you can backup some important SMS to computer. Tip 5. Reinstall Apps to Delete App History/Cache/Junk. “Documents and Data” on storage usage always take much space of your iPhone 6/6s/SE. And this method is helpful for fully removing “Documents and Data” of one app. Just delete you app and reinstall it. Note: This method will delete all history/caches on your iPhone, so don’t use this tip to clean your iPhone if the caches or history are important to you. For example, some WhatsApp chat history sometimes is very important to you, delete and reinstall WhatsApp may delete this kind of chat history. Some apps have their setting items to delete download files, chat history or something else to free up space, such as you can login YouTube to delete watch history and search history. Tip 7. Clean iPhone Junks with 3rd-Party Software. There are some tools you can use to 1-click clean junk files on your iPhone, such as PhoneClean, one iOS cleaner tool to remove iPhone junk, and it is compatible with any iPhone models, including old iPhone 4/4s in iOS 7, and new released iPhone 6/6s/SE in iOS 9.3.3.